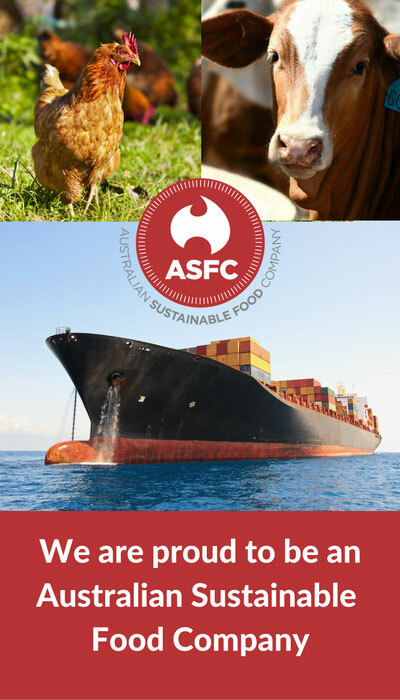 ASFC is a company created and owned by Aussie farmers who understand the contribution that Australia's rural and regional industries make. ASFC was started as means of connecting Ausse farmers and businesses to markets around the world. Our values set us apart from other exporters and traders in rural commodities, food and beverages. We uphold the Australian clean and green provision of quality protein products with guaranteed long term supply agreements. This relationship is established upon fair and equitable foundations through the entire supply chain. We are seeking new suppliers and producers to meet the increasing demand of our customers. We seek to build long term partnerships with our producers to enable our suppliers to benefit from the incredible opportunities in Australia’s export markets. In accordance with our sustainable values and as producers ourselves we want to work with you as a reliable partner to help you achieve greater things for your business and your family. Our expertise in logistics, export and distribution is the conduit to customers in these markets. We can also assist you gain international sustainability accreditation for your business and advise you on how best structure your business to maximise the benefits of exporting. If you are a livestock producer or a producer of seafood, beer, wine or poultry and would like to explore how you can benefit from connecting your business to Australia’s exciting export markets, please get in touch by completing the form below. Download our Supplier Info Pack.